With Clavey Paddlesports you don't need a boat and a bunch of gear to get on the water. 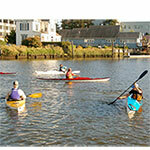 We provide all that in our kayak classes taught on the beautiful waterways of Tomales Bay and the Petaluma River. Our trained guides and instructors are regularly certified and highly experienced. And with them we love sharing the joy of touring our local bays and tidal esturaries, or helping you to become a better paddler. When you join Clavey Paddlesports for either a class or tour, you're embarking on a memorable and exciting adventure on the water - one you'll be sure to tell your friends and famly about for years to come.